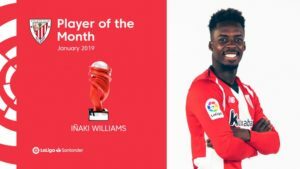 Athletic Bilbao striker, Inaki Williams has been crowned LaLiga Santander Player of the Month for January. The Ghanaian international claims the prize on the back of an outstanding month, in which he played an instrumental role for Los Leones, who have enjoyed a real upturn in fortunes since Gaizka Garitano's appointment in early December. Athletic's speed merchant produced some sensational performances in the competition in a month of January that saw the side's five outings yield a trio of wins and a draw and defeat apiece. Williams will collect the award in front of the San Mames faithful before Sunday night's meeting with FC Barcelona, a game that kicks off at 20:45 CET.